modify_locus_descriptions - allowed to modify the description text and external hyperlinks used. Even with this setting, only loci for which a user is explicitly set as a curator can be modified. This tells BIGSdb to deny access to anybody unless their account name appears within a file called users.allow within the config directory. The users.allow file should contain one username per line. You can also use a usergroups.allow file. This file should contain the names of user groups, the members of which are allowed access. The file should contain one user group name per line. 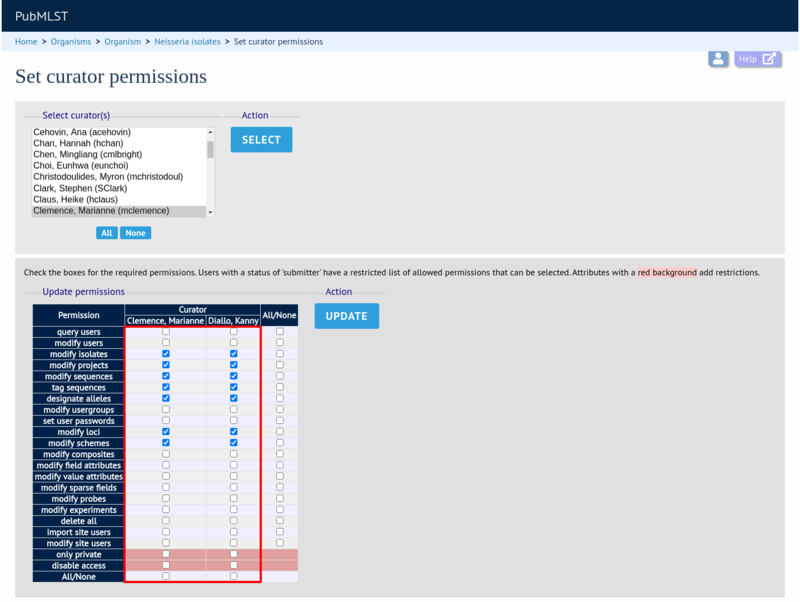 If you are an administrator or a curator with specific permission to change other users’ passwords, you should see a ‘User passwords’ box in the admin section of the curator’s index page. Click the ‘Set passwords’ link. to the system tag of the database XML file. If the system_flag value is not defined then the plugin is always enabled if it is installed on the system. If the system_flag value is set to ‘no’ then the plugin will be disabled even if the all_plugins attribute is set to ‘yes’. 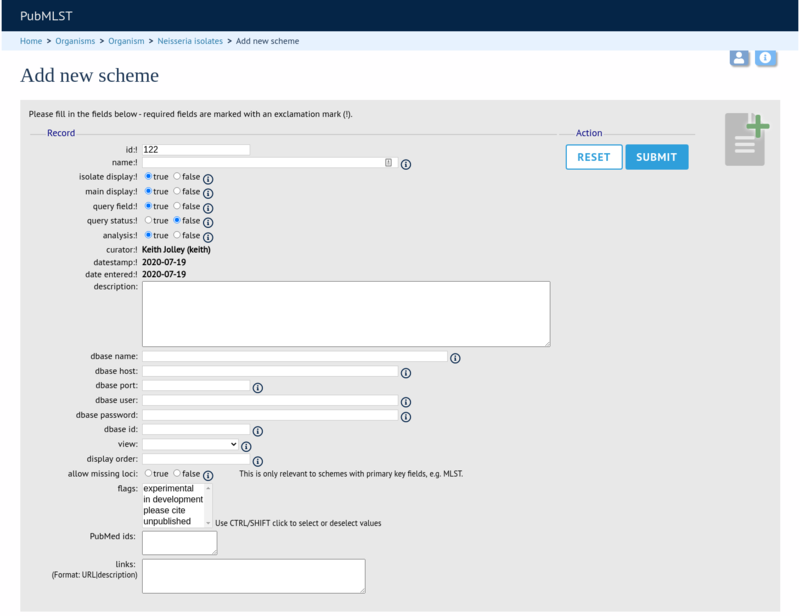 With this attribute, the curation interface now has options to add sets, and then add loci or schemes to these sets. These functions are normally hidden, so you may need to click the ‘Show all’ toggle to display it. 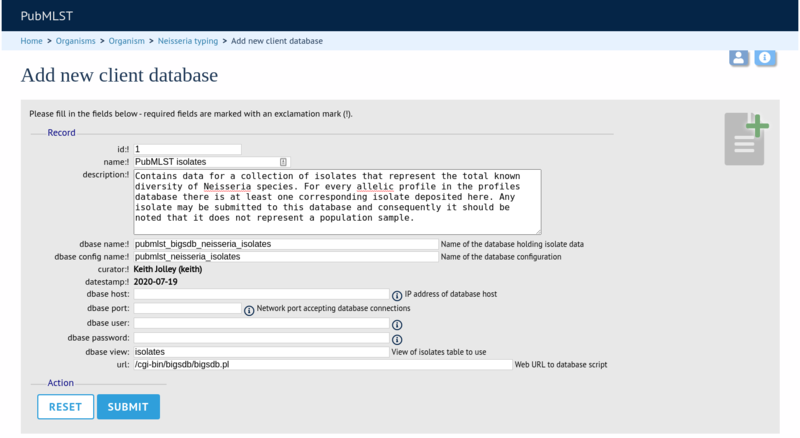 Once a site-wide user database has been set up, this can be defined within each client database as follows. From the curators’ contents page, click the add (+) user databases link. This function is normally hidden, so you may need to click the ‘Show all’ toggle to display it. 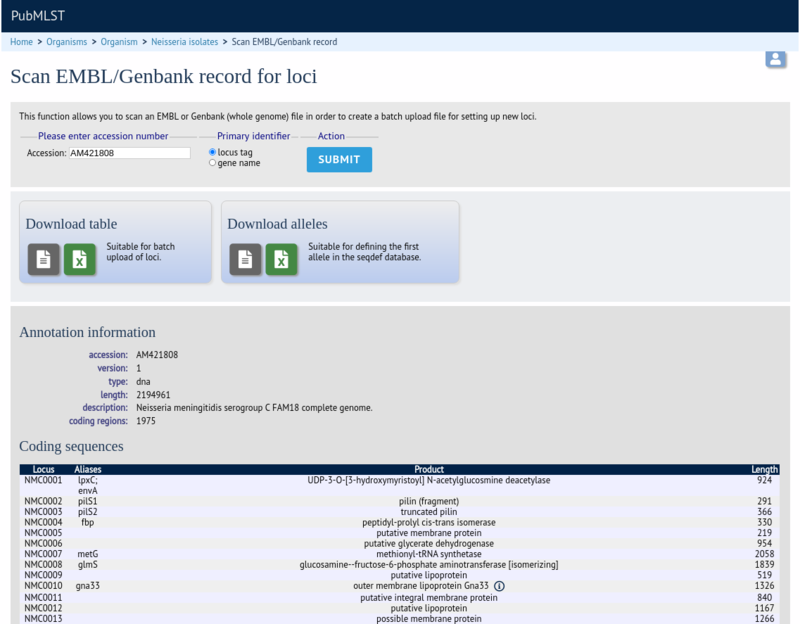 Click the add (+) loci link on the curator’s interface contents page. This function is normally hidden, so you may need to click the ‘Show all’ toggle to display it. 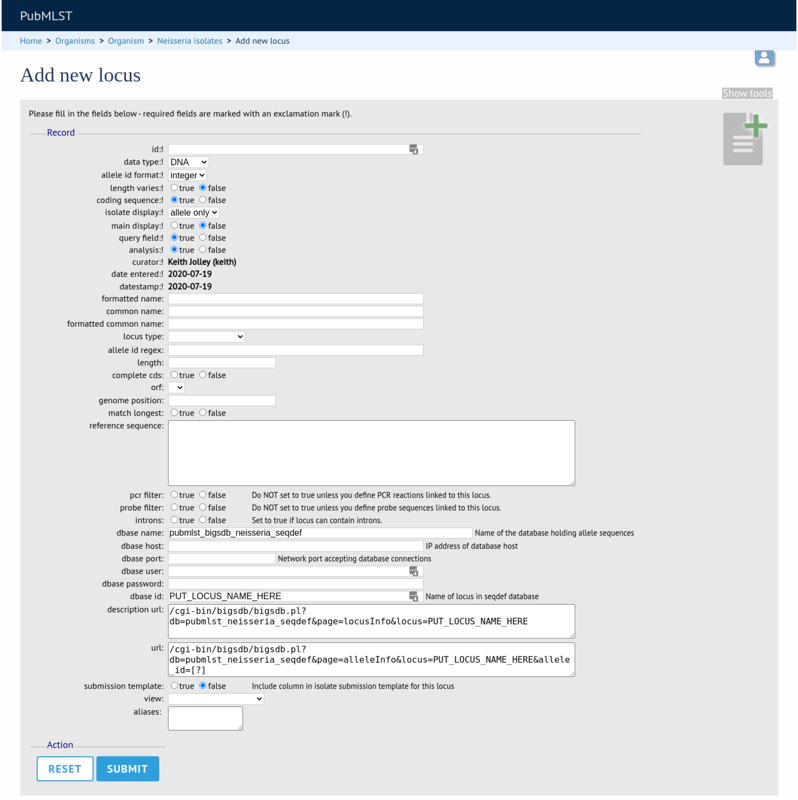 Click the batch add (++) loci link on the curator’s interface contents page. This function is normally hidden, so you may need to click the ‘Show all’ toggle to display it. 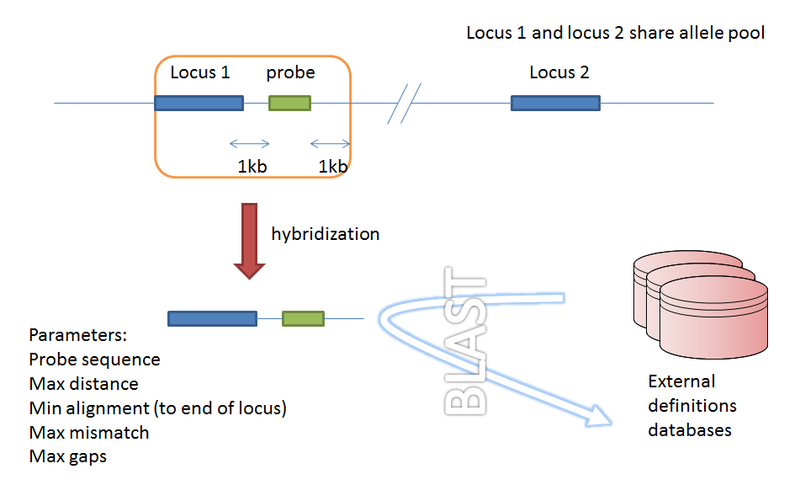 description_url - The URL used to hyperlink to locus information in the isolate information page. This can either be a relative (e.g. /cgi-bin/…) or an absolute (containing http://) URL. 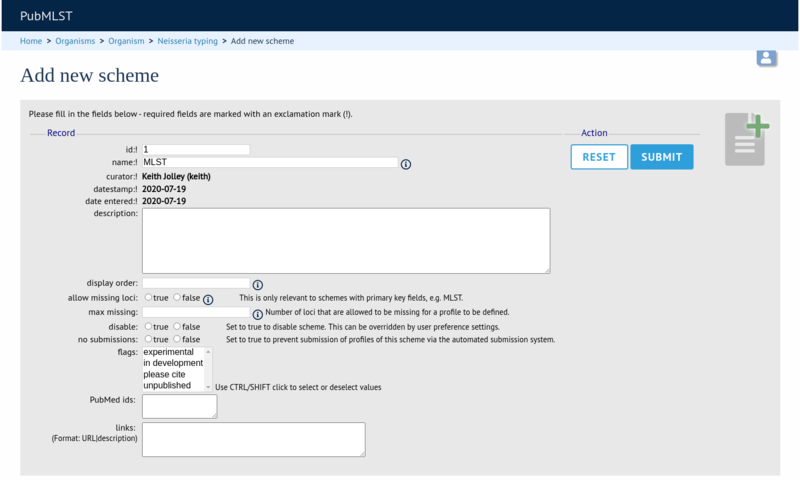 view - Restrict this scheme to only isolates contained in the specified database view. This option will only appear if the views attribute is set in the system tag. The view needs to have been defined in the database as a subset of the isolate table (usually filtered by the value of one or more of its fields). 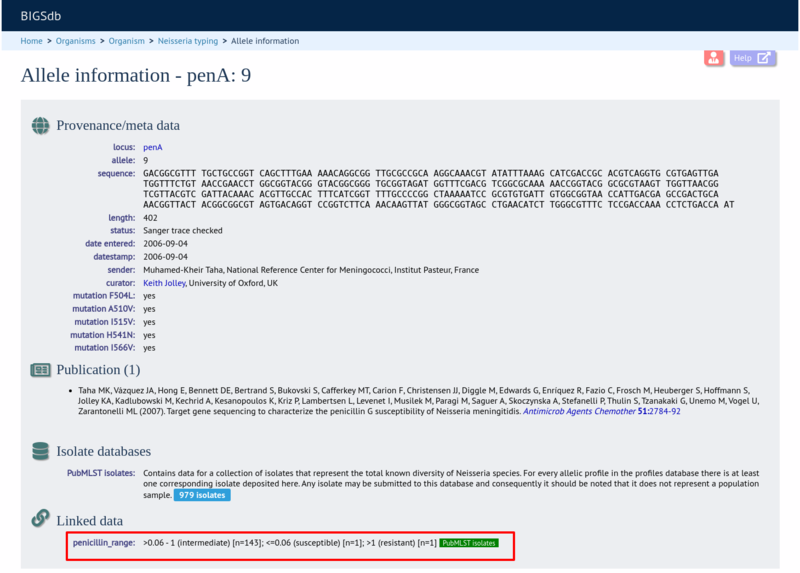 To add extended attributes for a locus, click add (+) locus extended attributes in the sequence definition database curator’s interface contents page. This function is normally hidden, so you may need to click the ‘Show all’ toggle to display it. Click the add (+) scheme link on the curator’s interface contents page. This function is normally hidden, so you may need to click the ‘Show all’ toggle to display it. 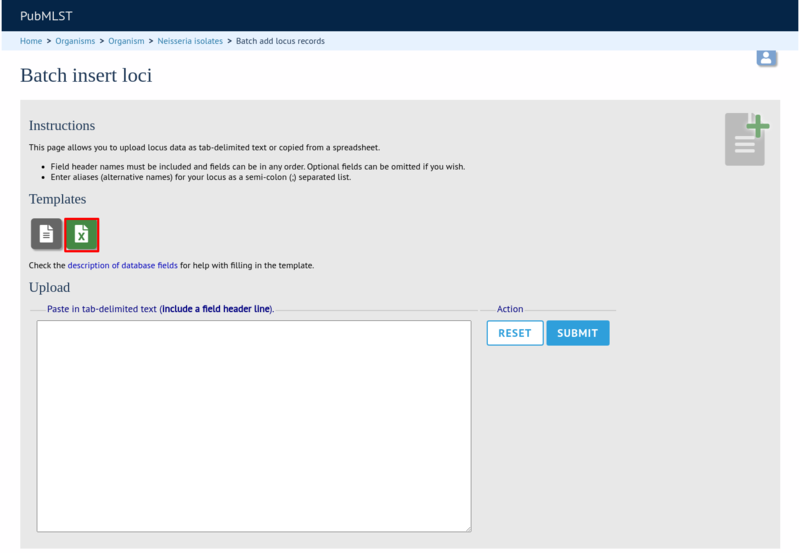 To add loci to the scheme, click the add (+) scheme members link on the curator’s interface contents page. This function is normally hidden, so you may need to click the ‘Show all’ toggle to display it. 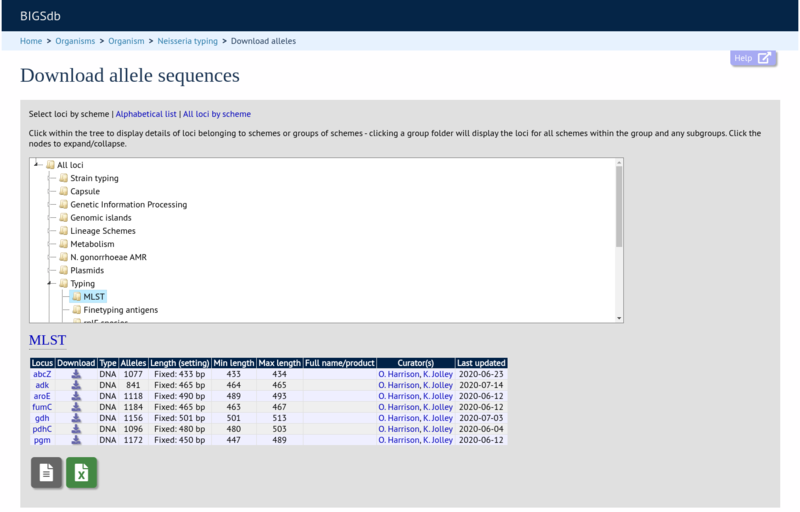 Scheme groups can be added in both the sequence definition and isolate databases. To add a new group, click the add (+) scheme group link on the curator’s contents page. This function is normally hidden, so you may need to click the ‘Show all’ toggle to display it. 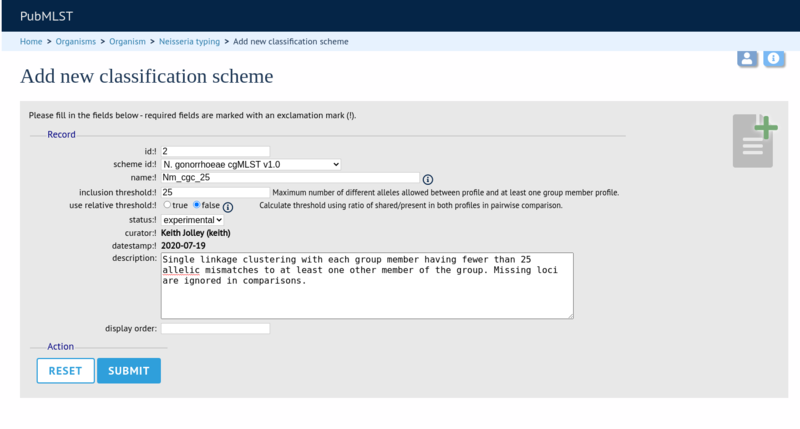 Schemes can be added to groups by clicking the add (+) group members (scheme) link. 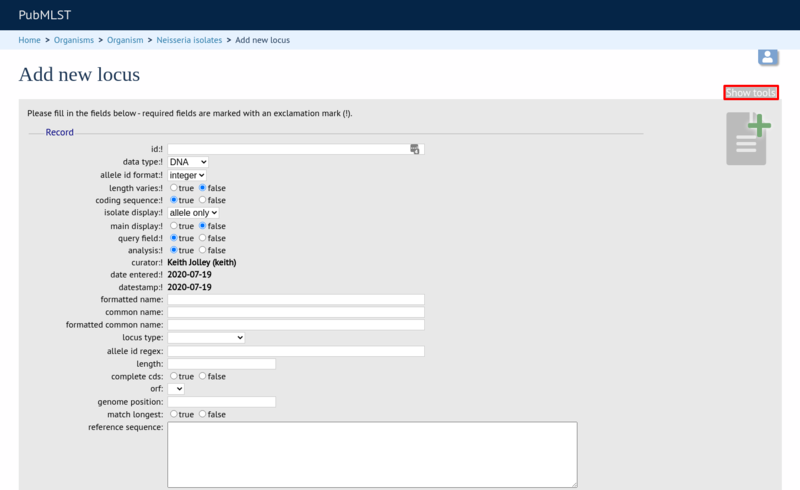 To register a client isolate database for a sequence definition database, click the add (+) client database link on the curator’s interface contents page. This function is normally hidden, so you may need to click the ‘Show all’ toggle to display it. 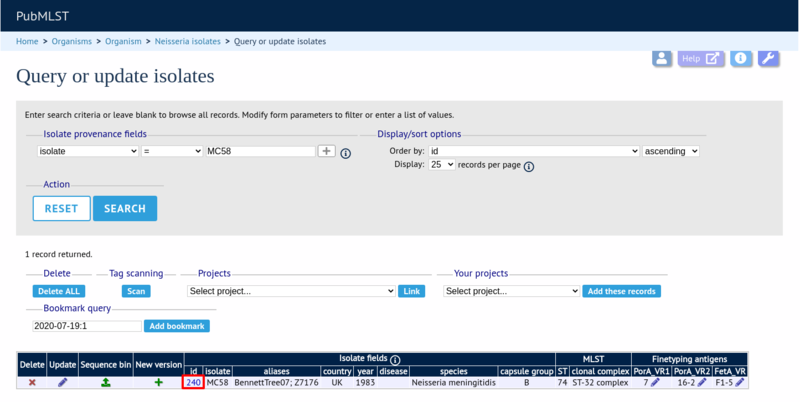 Once a scheme has been defined, add a classification scheme by clicking the add classification schemes (+) link on the curator’s interface contents page. This function is normally hidden, so you may need to click the ‘Show all’ toggle to display it. Duplicate the scheme definition from the sequence definition database. 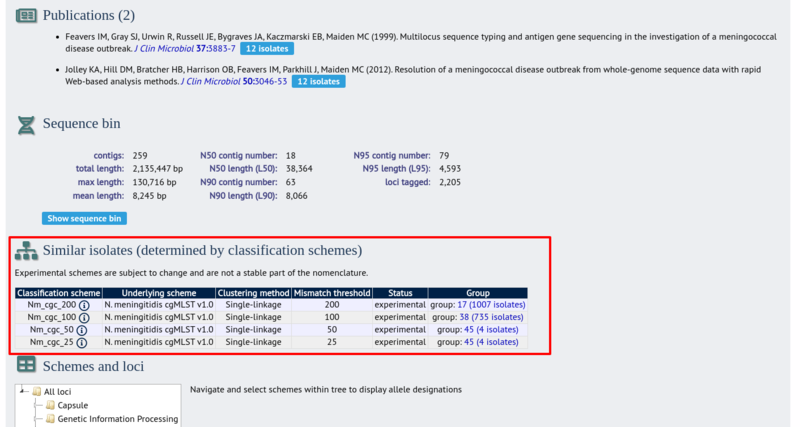 Click the add classification schemes (+) link on the curator’s interface contents page. This function is normally hidden, so you may need to click the ‘Show all’ toggle to display it. 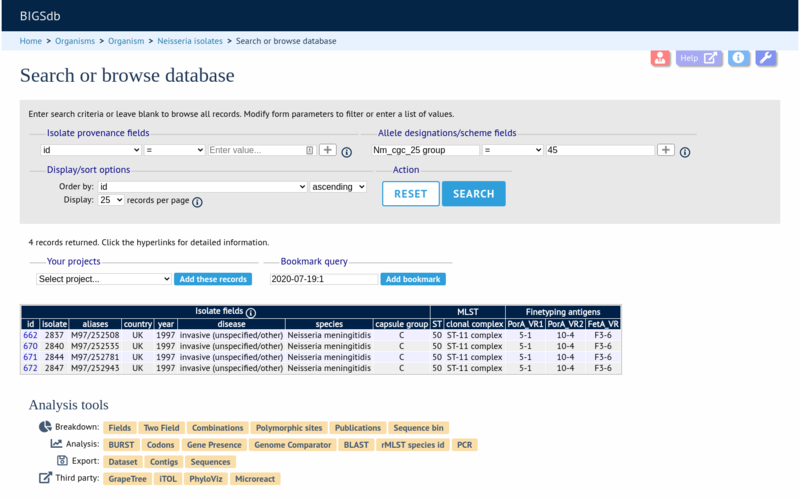 Click ‘Database scan’ within the ‘Loci’ group on the curator’s contents page. This function is normally hidden, so you may need to click the ‘Show all’ toggle to display it. 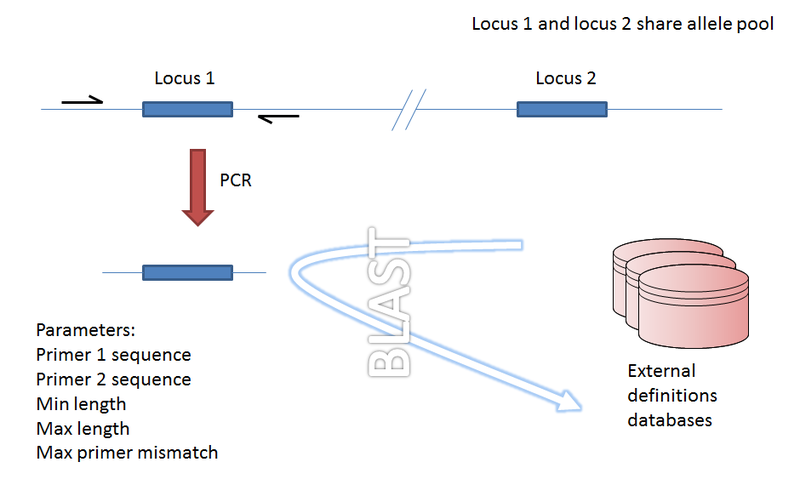 Provided a locus can be predicted to be specifically amplifed by a PCR reaction, the genome can be filtered to only look at regions predicted to fall within amplification products of one or more PCR reactions. 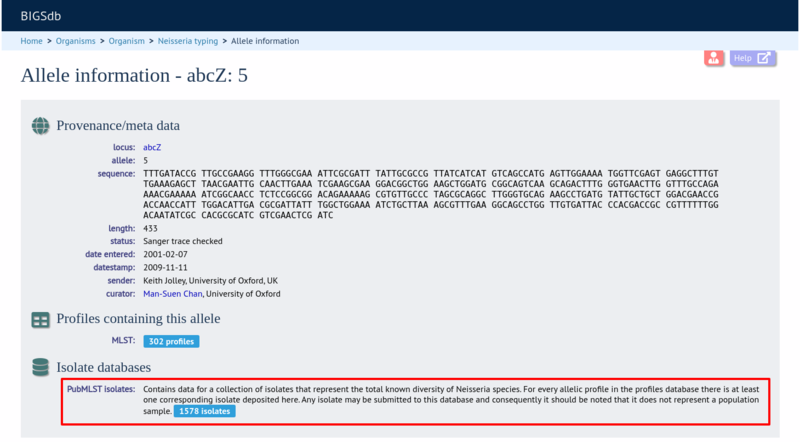 Since this is in silico we don’t need to worry about problems such as sequence secondary structure and primers can be any length. 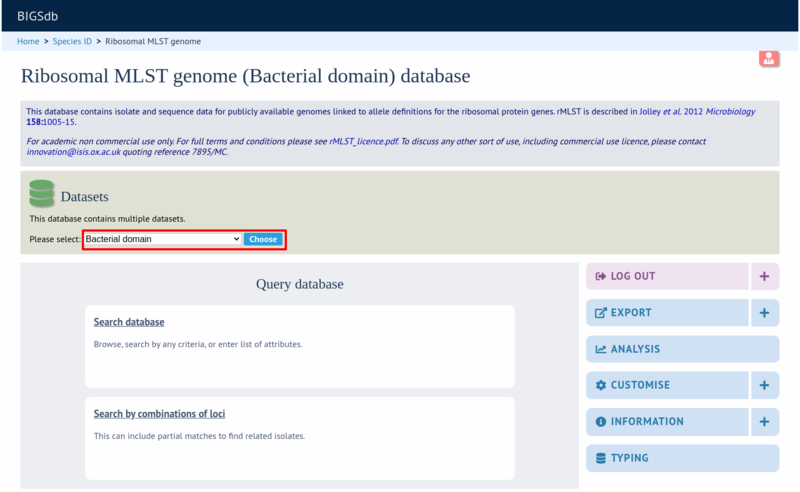 To define a PCR reaction that can be linked to a locus definition, click the add (+) PCR reaction link on the curator’s main page. This function is normally hidden, so you may need to click the ‘Show all’ toggle to display it. 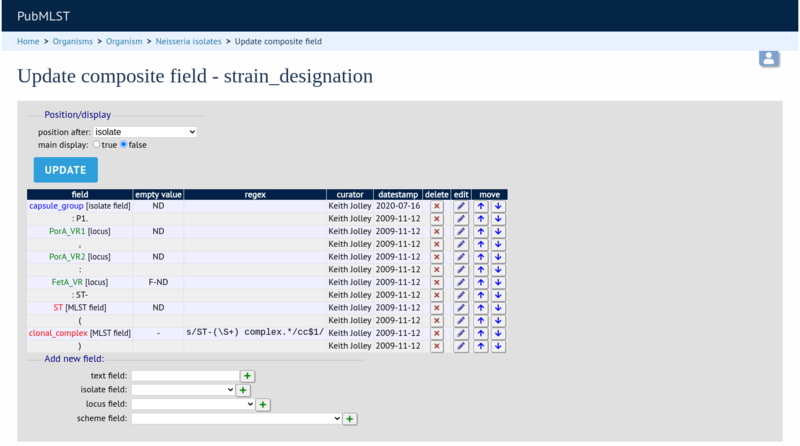 Composite fields can be added to the database by clicking the add (+) composite fields link on the curator’s main page. This function is normally hidden, so you may need to click the ‘Show all’ toggle to display it. To set up such an extended attribute, click the add (+) isolate field extended attributes link on the curator’s main page. This function is normally hidden, so you may need to click the ‘Show all’ toggle to display it. The easiest way to populate the lookup table is to do a batch update copied from a spreadsheet. 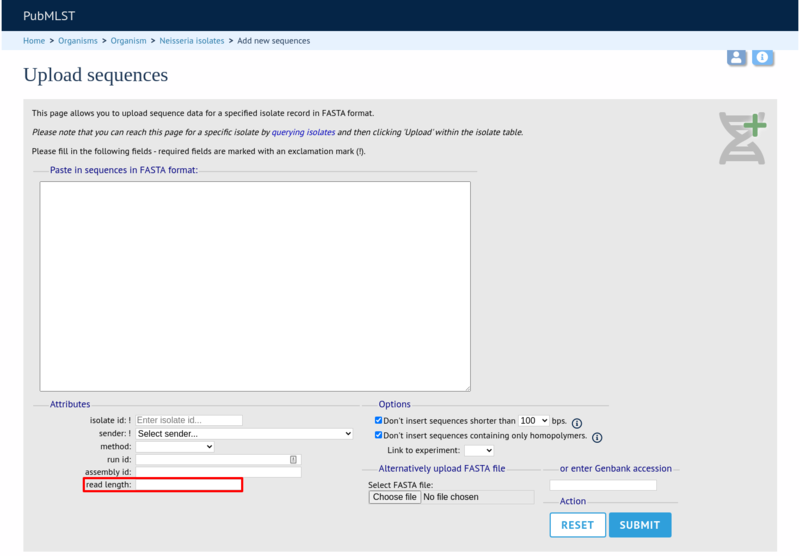 Click the batch add (++) isolate field extended attribute values link on the curator’s main page (this link will only appear once an extended attribute has been defined). This function is normally hidden, so you may need to click the ‘Show all’ toggle to display it. 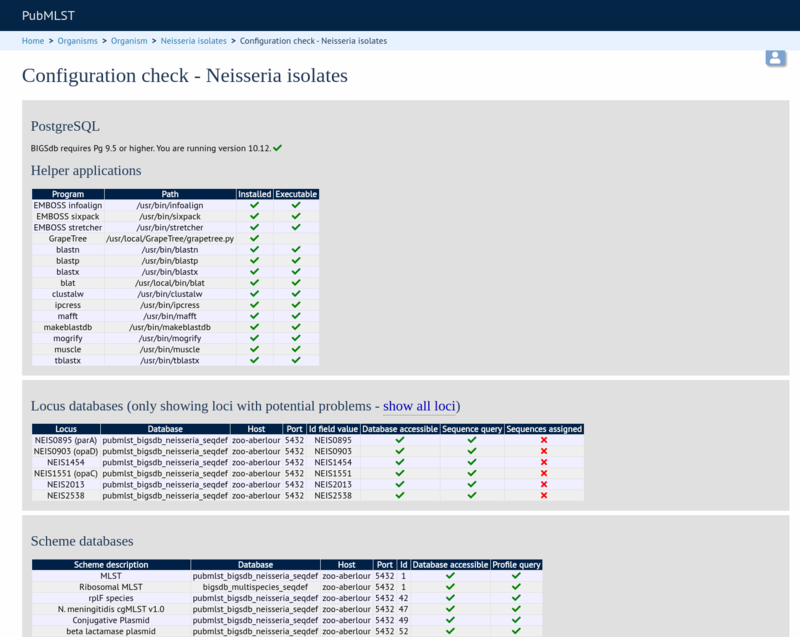 To set up new attributes, click the add (+) ‘sequence attributes’ link on the isolate database curator’s index page. This function is normally hidden, so you may need to click the ‘Show all’ toggle to display it. 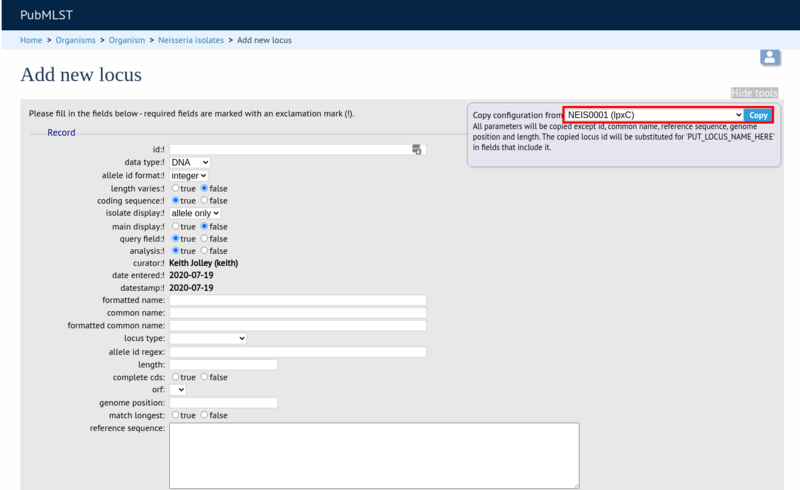 Sometimes it is useful to transfer configurations between different databases or to export a configuration for troubleshooting. Data from most of the tables can be exported in tab-delimited text format suitable for batch uploading. 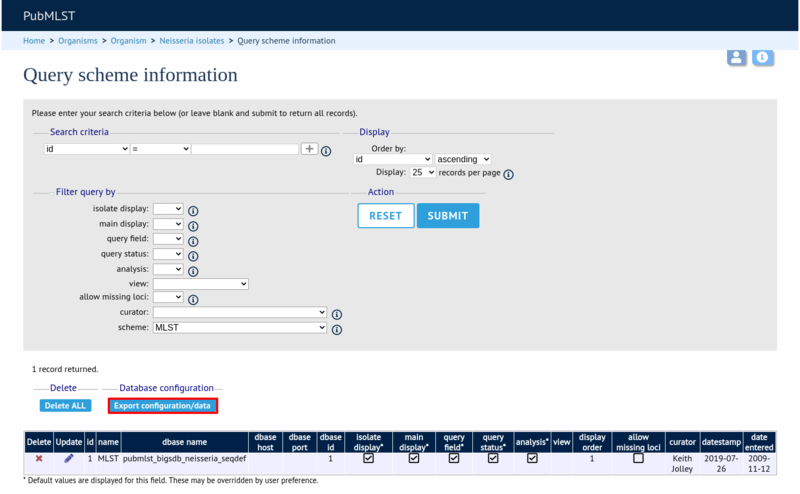 For example, to export scheme configuration data, click the query link (Update or delete) next to schemes in the curator’s interface. This function is normally hidden, so you may need to click the ‘Show all’ toggle to display it.